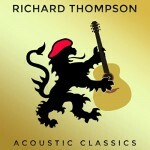 Share the post "Album review: RICHARD THOMPSON – Acoustic Classics"
Amazingly this is the first acoustic release (excluding live recordings) in over thirty years. This collection of his most famous songs newly recorded in acoustic form provides the perfect accompaniment to his solo acoustic shows. When done acoustically the guitar playing skills of Richard Thompson really shine through. You can but marvel at the dexterous playing on ‘Down Where The Drunkards Roll’ or ‘1952 Vincent Black Lightning’. Particular favourites in this style are ‘Valerie’ that keeps its tempo even though the rock ‘n’ roll backing has gone and ‘Beeswing’, played and sung beautifully. All the big hitters are here, from a wonderful run through ‘I Want To See The Bright Lights Tonight’ and the most well known number with Linda Thompson, ‘Shoot Out The Lights’, albeit slightly strange having just the one vocal. This entry was posted in ALBUM REVIEWS, ALBUM REVIEWS (Mobile), All Posts and tagged acoustic, Acoustic Classics, album, Fairport Convention, folk, guitar, guitarist, Linda Thompson, review, Richard Thompson. Bookmark the permalink.